Residents of MNS were cool headed and peaceful people, hard working and honest to the core. Never took part in communal riots as would happen on taking out Tazias on 10th of Muharram, Diwali, Holi ( when Hindus throw coloured water or powder on every one) etc. in the city. Simple in customs, Mangnis and marriages were practical devoid of fancy functions as are being practiced today. Female relatives girls particularly would assemble in evenings, singing or dancing for celebrating Mangni, and for a few days prior to marriages, these were private get together exclusive for ladies only. 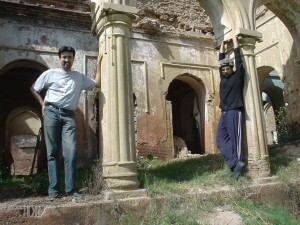 Local marasans ( lady bards) did participate on occasions mainly for tips. Male bards (Bhands singing praising songs and resorting to humorous jokes culminating in hitting palm of the partner twice with a leather piece for audio effect) did the same for men. Dulha invariably rode a horse in Baraat accompanied by local band some times, dulhan departed from parents house in a Doli. Dinner and Walima were standard Pillou, Alu Gosht with Naan and at best Zarda as dessert. No chicken or fancy dishes were served; thus bringing about equality amongst the residents, rich or not so rich. MNS was to a large extent self sustained, conservative Mohalla having not too large a population. Shopping was done by male members or servants only. Ladies never went to bazaar, they could, however, buy from hawkers. Even elder males also did no shopping in Bazaars. I never saw my father or uncle doing so. Bales of cloth, for example, were brought by shop keepers to houses for selection of the family.. When on Eid or occasions necessitating passing through bazaar, mostly Hindu shopkeepers of Sarafa (bullion dealers) and Bohra Bazaar, adjacent to MNS, would stand up and pay respect. At home food was taken on floor generally around a dastar khwan. So were the evening gatherings particularly in winter on the floor padded with gaddas (mattresses) and having Gao Takias (round pillows) for resting the back. As there was no other entertainment like cinema (there was one open to sky walkie-talkie as cinema were called, after the silent movies, near the station showing not worthwhile pictures) no radio or TV, these gatherings full of gossip were popular. My elder brother being a cheerful vibrant soul, used to hold such durbar every night after dinner till late at night. Large squarish room, called barra or gole (round) room of the house was the venue, with serving of Kashmiri tea and dry fruit. After prayers on getting out of mosque, men folk would often gather around and chat for a while at the intersection of main MNS street with Chatha Lane, making difficult for ladies to cross. On the down side, MNS shared with India as a whole breaking out of epidemics like cholera, small pox or plague. I remember vividly in 1934 sic evacuating MNS and moving to one of our village Rashidpura 6 miles away having a havelli, for only two nights as it was a false alarm. Children of MNS were collected at Barrister M Sharif Khan’s villa every year given injection and vaccinations, small pox vaccination was messy affair having thee drops of vaccine on the fore arm, skin squished and scratched with a needle for blood to ooze out. This left a star like scar on the arm. My cousin Salahuddin would invariably faint in the process. I do not recall any break out of an epidemic, but in early twenties or so there was one. Husband of my younger Khala Musharaf and Chacha of general Fazle Muqueem Khan fell ill and so did their only child, a son 7 years old. While tending to them, Khala also caught the disease. She fortunately recovered from it to find that both, her husband and son, gone during her illness. It took long time for her to overcome this grief understandably. Inheritance by only daughter. Bassi being a part of princely state of British India, Indian civil and criminal laws were applicable, creating at times controversy as these were in conflict with Islamic laws as prescribed in Quran. According to Indian Law a single daughter could inherit the entire assets, whereas Quran permits only half (a son full). Marium Khanum the middle sister of my Dada M Ashraf Khan and brother M Sharif Khan was married to a very rich gentleman living in a large white painted house in the center of city. Their only child Shafiqua Khanum inherited the entire property, and in turn her adopted daughter Masooda Khanum inherited hers. She being married to General Fazle Muqueem Khan acquired Suffolk House, against her claim of Bassi property, where all Muqueems have houses, commercial complex, petrol pump, etc. Inheritance by daughters. Conversely, Indian Civil Law permitted inheritance to daughters, but Muslims of Bassi and India in general daughters were kept devoid of inheritance, a clear violation of Quran as well which clearly lays down half the share of a son to a sister. This half share of sister applies for inheritance only, during life time in Islam, parents are supposed to treat sons and daughters equally at par. This unfortunately does not always happen as mothers particularly have a bias towards sons. Though both have a role to play, boys add to your strength, and daughters provide happiness. Such discriminate treatment makes the child self centered and indifferent. Similar is the case of many other widows who spoil their youngest orphan child with misplaced indulgence. Adoption. Then there was the question of adoption which was permissible in Indian Civil Code but not so by Quran. There were three such adoption cases in MNS at the time of partition. Firstly when Barrister M Sharif Khan, childless Chacha of my father, took away my eldest brother Ihtisham H Khan, a vivacious and cute child when he was only 7 year old from Jakhal a place far from Bassi near Bhatinda where my father then posted. It was traumatic for my mother to part with her first born and must have been equally traumatic for him to have all the luxuries but devoid of the divine blessing in form of a mother. As related by my second eldest brother, absence of leader broke the trio of brothers full of fun and antics. Adoption is tough for all. As stated earlier Shafiqua Khanum adopted Masooda Khanum daughter of her cousin and my younger Chacha Anwar ul Haque Khan; and third one being adoption by my younger Khala, after loss of husband and son in epidemic stated earlier, of her niece Shaukat Khanum middle daughter of her elder sister Shafiun Khanum. Omarzais of MNS, like all Muslims in India violated Quran in all the 3 accounts given above, viz, a single daughter inheriting all, daughters having brothers were not given any inheritance and lastly the practice of adoption entitling adoptee full inheritance. These practices still continue in villages and remote parts of Pakistan with additional cruel customs such as Karo Kari, Vani, etc accepted by educated and responsible persons like MNAs, MPAs in the name of tradition, custom; whereas Mohd PUBH had forbidden in Islam these very inhumane practices of handing over an infant girl in lieu of a perpetrated crime by some one else, burying live women and girls, etc. Prayers in MNS mosque were led by a simple Maulvi Sahib, living off dole by the residents of MNS – not much. Most of us youngsters were fond of calling faithful to prayers by Azaan from the mosque. Quran was taught by couple of elderly ladies, rest about Islam was learnt from parents. MNS had a graveyard of its own, accessible through passage of the mosque . That should suffice for the time being, customs figure in other articles as well. 1st row: Aziza Khanum (Sherry’s Nani) and Humaira then Mahbooba Khanum. 2nd row: Hamida Khanum and Mustafai Khanum. 3rd row: Ihtisham Khan, Ziaudin Khan, Masooda Khanum, Mazhar Khan and Faizul Haque Khan. 5th row: Mahmooda Khanum, Salahuddin Khan and Mohammadi Khanum. 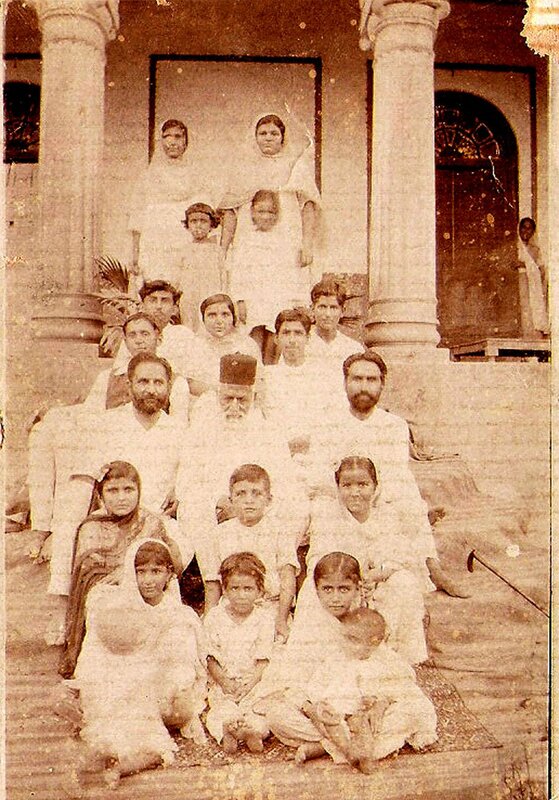 6th row: Ahmadi Khanum, Inam Khan and Khalida Khanum. PS. In my last article on houses of MNS, I had mentioned sweepers doing all the dirty work. These were Hindu Achuts (untouchables) or Shudhers – the fourth category of Hindu Caste system. (In Bengal including Bangla Desh Muslims do this dirty work). Gandhi termed these Untouchables very cunningly as Harijans – children of God. First category being Brahmins the religious people on top, followed by warriors, rulers, etc; third being commerce and business Banias. Thus the society is straight jacketed. Caste system is deep rooted in their religion and excepting some cities, is still being fully practiced despite claims by government to have done away with it A Brahmin does not tolerate an achut in the same room. Hindus will not have food on the same table with us Muslims as personally observed by when a Hindu officer by name of Mr Moon living on Hall Road, Lahore invited my father and me to lunch at his house. Equality amongst human beings in Islam attracted many Hindus, of lower cast specially, to convert to Islam. Nana, I’m incredibly lucky to have you write all of this about our past, otherwise we might never know. Keep writing, it’s awesome! You might have mentioned this in an earlier post, but what does MNS stand for? You also talked about how the MNS would not take part in riots against some of the Hindu festivals. So people would be angered by their festivals?